Child Contact Centre Manager with a local Relationships Scotland service, Pauline is married with two sons and one budgie. Her elder son, who is 23, has just recently left home for London. 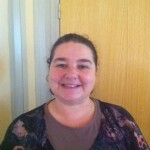 Pauline has been with Relationships Scotland – Family Mediation South Lanarkshire for 10 years where she started as a volunteer at the child contact centre. Her background is in childcare and she has trained as a counsellor. Pauline is a registered mediator, delivers Parenting Apart Groups and frequently write for the Scotland on Sunday Lifelines column.